“Smart technology is the key to amore personalized travel experience,” says Joshua Sloser, SVP Digital, Hilton. 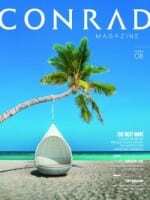 In an increasingly smart world—where we are able to check into flights from our phones and remotely control the temperature of our homes—the digitization of hotel guest rooms is the next big thing for Conrad Hotels and Resorts. We are always seeking new and better ways to go above and beyond the expectations of our digitally savvy, globetrotting customers; to make things much simpler, eliminate friction in their travel experience and better recognize and reward loyalty. Technology gives us an amazing toolkit to do just that. From airport kiosks to car-rental stations, travelers expect a self-service option at every step along their journey, and we were the first hotel to offer advanced check-in and room selection via an app. Similar to airline check-in, the Hilton Honors app and website displays a floor plan of the hotel, showing you which rooms are available, meaning you can secure that all-important view up to a day before arrival. The Digital Key function on the app takes the self-service experience one step further, allowing guests to head straight to the hotel room, bypassing the front desk altogether using their mobile device. As self-directed travel becomes the norm, the role of the hotel is not just about handing over the controls to the guest, but anticipating their needs in advance. That’s where our high-tech platform Connected Room comes in. If we know, via your phone, that you like your room at 70 degrees, we will set that temperature for you before you get there. Equally, the entertainment systems in our hotels will be personalized so that your preferred channels will be on your TV when you walk into the room. Rolling out the Digital Key technology means replacing door locks, but when one door closes, another one opens. Travel presents us with possibilities we don’t have when we stay at home, and in the same vein, digital is opening up new ways to build inspired moments.